The iPad 2 is getting all sorts of praise, but something interesting is emerging: Are its light weight, large screen, and twin cameras perfectly positioned to make the iPad an Augmented Reality giant? The iPad 2 is getting all sorts of praise, but something interesting is emerging: Are its light weight, large screen and twin cameras perfectly positioned to make the iPad an Augmented Reality giant? Augmented Reality apps have slowly proliferated on smartphones, bringing a novelty and genuine usefulness to some data streams that are overlaid on reality through the device’s rear cameras, but now there are tablet computers with rear cameras, too. 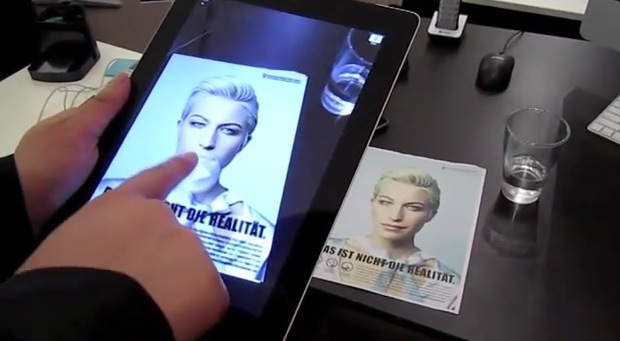 Freshest, and perhaps most potent, among the list of tablets is the iPad 2, and already some AR apps have surfaced for it. The potential for clever real-world ad-related AR apps is immediately evident from the video, along with rich media content hidden in AR links inside printed material like newspapers. String Labs, the London-based company behind a recent AR SDK for the iPhone, and which supplies AR tech for News Corp.’s e-newspaper The Daily, has also been experimenting with the iPad 2. One of the counter-arguments repeatedly mounted against the progression of AR on smartphones is the need to hold a phone up in front of a user’s field of vision–a tiring act that can’t be kept up for long. Tablets by their very nature are heavier and thus more difficult to use in this position, although the fact one tends to use two hands to lift something as large as a tablet would certainly help. But the most convincing thinking about the use of tablets for AR is their larger screens are much better for delivering rich media content–think of how much more attractive an interactive ad is on a 10-inch screen versus a four-inch one. Enter the iPad 2, with a 9.7-inch display, new lighter chassis that’s easier to hold, and both front and rear cameras. All the tests of the iPad 2’s graphics powers place them well above its peer devices–excellently placed to deliver near-real-time video processing and 3-D graphics overlays of the sort Metaio is testing out. Apple‘s device is also expected to pretty much seal up the tablet market at least for the next year or so, which is a big incentive for developers to concentrate their efforts on Apple’s machine rather than others, and AR could easily become one of the iPad 2’s killer apps. All you’d need to do to demonstrate this is hold up your own iPad and show off a clever AR app to someone new.